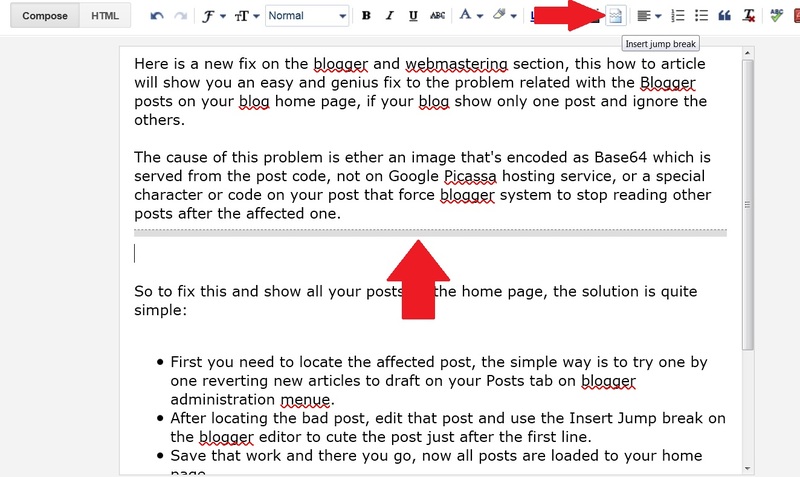 Here is a new fix on the blogger and webmastering section, this how to article will show you an easy and genius fix to the problem related with the Blogger posts on your blog home page, if your blog show only one post and ignore all others new. The cause of this problem is either an image that's encoded as Base64 which is served from the post code, not from Google Picassa hosting service, or a special character or code on your post that force blogger system to stop reading other posts on the homepage after the affected one. First you need to locate the affected post, the simple way is to try one by one reverting new articles to draft on your Posts tab on blogger administration menu. After locating the bad post, edit that post and use the Insert Jump break on the Blogger editor to cut the post just after the first line or first paragraph. Save that work and there you go, now all posts are loaded to your home page. If this continue search for another post that may include the same problem and do the same. If you have any problem don't hesitate to comment below. I have a similar problem since 2 days, posts I have planned for the next day at noon are not published automatically anymore. Do you have an answer to this problem ? and there's are two "read more" after insert jump break but my blog is more lighter to load. can its possibly show 10 posting at same time in home in blogspot ?? Thank you for a fix for this annoying problem. Google Map for NES using 8bit system !